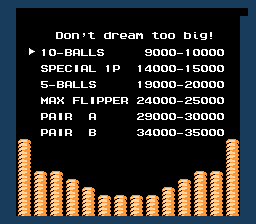 Rock’n’ Ball is a pinball game for the Nintendo Entertainment System. Family Pinball is a four player game with four different modes. 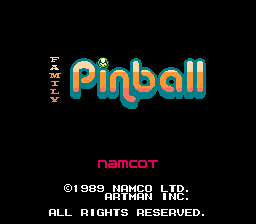 There is a traditional pinball machine with a Pacman theme, a battle mode (offering three different tables) in which your opponent and yourself try to knock the ball past each other’s flippers at opposite ends of the table, a sports mode which is similar to battle mode except with soccer and hockey themes, and a pachinko mode. 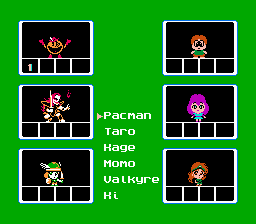 Rather than simply referring to the players as Player 1 - 4, each player also gets to select a representative from amongst six Namco characters, only one of which ever made it to an American release.